Author: Marie Edouard Mott, C.M. & Robert A. Macdonald, C.Ss.R. · Year of first publication: 1961. Daughter of Clement Bisqueyburu, merchant, and of Ursula Albine d’Anglade, our Sister was born at Mauleon (Lower Pyrenees) on November 11, 1817, feast of St. Martin, was Baptized the following day, and received the name of Justine. We know almost nothing of her connections and early childhood, unless it be that her mother’s kinsfolk lived at Loteron: There she at an early age (for what motive is not known) was intrusted to her maternal aunt, Miss d’Anglade, and to Mr. d’Anglade, who took a great liking to her and at his death left her all his fortune. With them, she grew up, received her First Communion and was educated. When the time came for her decision as to a state of life, the Divine call came to her, though we know none of the circumstances. All we do know is that she was then twenty-two years old and that she asked this permission of her aunt, Miss d.Anglade, who loved her dearly and who would have wished to keep her. A thorough Christian, however, she would not thwart the designs of God upon this soul and hence let her go, toward the end of August, 1839, to make her postulatum at the hospital of Pau under the guidance of the venerable Sister Vallier. Her postulatum having expired, she left for Paris to begin her Seminary or Novitiate. Strange to say, she made the journey in care of the saintly priest who was soon to become the confidant of the extraordinary graces with which she was favored, a circumstance willed by a particular design of Divine Providence. This was Father Aladel, Director of the Daughters of Charity who, happening to pass through the city of Pau on his return to Paris, willingly agreed to accompany the young postulant on her journey. She entered the Seminary November 27, 1839, on the ninth anniversary of the famous apparition of the Immaculate Virgin to Saint Catherine Laboure, an apparition to which the Miraculous Medal owes its origin. The good Father Aladel, who was so wisely directing Sister Catherine Laboure in her extraordinary ways, did not suspect that confidences somewhat similar were soon to be reposed in him by this postulant. As one can see, her piety had not escaped the eyes of her Directresses who, in these remarks, had condensed the results of their observations. But the First Directress alone, Sister Buchepot, had been able to see, from receiving the communications of the young Sister, to what degree her soul was united to God. Favored as she was from the beginning of her Seminary with extraordinary graces, of which we shall speak at length in part two, she knew how to keep them secret and spoke of them only to those charged with her direction. The remarks written at the time of her receiving the Habit end with these words, “Fit for school.” And, in fact, her first employment on leaving the Seminary was that of school teacher at Blangy, a small place situated in the Department of Seine-Inférieure. Yet she did not stay there long, for in 1841, we find her in the House of Charity of Notre-Dame parish at Versailles, where she remained until 1855. It was there she made her first Holy Vows. There also she had the opportunity of spending herself unreservedly in the practice of charity, revealing the extraordinary aptitude with which she was gifted for the care of the sick. Her good Superior, Sister Le Pelletier, was afflicted with a cancer on the tongue which caused her cruel sufferings and required delicate attentions most repugnant to nature. Sister Bisqueyburu considered herself happy to bestow this care upon her and did so with great affection. Night and day was she at the bedside of the venerated patient, endeavored to soothe her pains and anticipated her last wish; and when the moment of supreme separation arrived, her filial devotedness inspired her to render less painful the ever-momentous passing from time to eternity. When the Crimean war broke out in 1854 and military authorities made an appeal to the devotedness of the Daughters of Charity for the nursing of the wounded soldiers on the battlefield, the Superior readily complied with her expressed wish to be employed for that purpose. She left for Constantinople in 1855 with the other Sisters destined to the same charitable functions, and, like them, she devoted herself unreservedly to this work. The devotedness of the Daughters of Charity in the painful labor of the ambulances, aroused an admirable enthusiasm in those who witnessed it regardless of religion or nationality, and provoked a generous emulation, even within the ranks of schism and heresy. An English lady, Miss Nightingale, who had been for a long time at the head of the Anglican Association of Charity in London, conceived the thought of endowing her country with an institution similar to that of the Daughters of Charity. She even went to Paris for the purpose of an interview with Father Etienne, their Superior General, begging him to show her the rules and organization of that Community that she might take a copy of them. After having obtained all that she wished, she left full of confidence in the success of her enterprise. At her return to France in 1856, Sister Bisqueyburu was given a duty which was like the sequence of the one she had efficiently fulfilled in Constantinople. She was placed at the military hospital at Valde-Grace in Paris, where she remained two years. One of the Sisters who lived with her at that time and later was placed under her charge at Rome —–Sister Bergasse—–testified that she was deeply devoted to her patients and that she possessed all the qualities of a true servant of the poor. Qualities as precious as hers determined Superiors to place her at the head of an establishment. The one first entrusted to her in 1858 was the Military Hospital of Rennes, which she was commissioned to open. But she remained only a few months and the last days she spent there were very painful, for, a month before her departure, she had received an order to be in readiness to be sent to Algiers at the first signal, and at the same time she was to keep the most absolute silence about it. The secret was indeed well kept, but the affectionate heart of the new Superior suffered from it. As she dearly loved her companions, as well as the hospital which she had put in excellent order, the thought of the impending separation was most painful to her and her grief was so much the greater as exteriorly she was not to betray the least sign of it. In this circumstance she revealed great strength of character, and when the order for departure arrived she at once complied with it and knew how to leave without commotion. At Algiers she was placed at the head of the Dey’s Military Hospital, a very important house which necessitated a sure and firm hand to direct it, together with a kind and motherly heart that would be guided by correct judgment. Sister Bisqueyburu showed herself equal to her task during the nine years she held this office, from 1858 to 1867. “I am trying to recall memories of long ago of this fervent soul whom I had the happiness to know and to love in our Lord. “On leaving the Seminary, I was for seven years under her direction. I was constantly thanking God for it, for, in the midst of the duties of that large hospital of the Dey at Algiers. I could fancy myself still under the direction of the saintly Sister Buchepot, our dear and venerated Directress of the Seminary. “Sister Bisqueyburu was a living rule. She drew our attention to the military exactness we had the opportunity to witness on the part of the nurses and patients in order by a comparison to inspire us with a greater, higher and more supernatural fidelity to our Holy Rules, of which she gave us a perfect example herself. “Everywhere the first in the accomplishment of duty, she surpassed us in the practice of humility and mortification. “Under an austere exterior appearance lay hidden a great kindness of heart. The illness of one of her companions was to her a most painful trial and when the patient died she was inconsolable. “In 1886, eight of our sixteen Sisters were stricken with cholera within less than forty-eight hours and three died immediately, This good Sister multiplied herself in order to attend to them all and at each new death she offered herself to God as a victim, begging Him to spare her companions. Thus long ago did Saint Louise de Marillac. Her grief was truly painful to behold, and our worthy Director, the Very Reverend Father Doumercq, had great difficulty in cheering up this otherwise energetic soul. Five successive times I have seen her maternal heart submitted to this trial. It was really heartrending. And yet her resignation to God’s will was perfect. “Her esteem for our dear vocation was so deep that she could not understand the slightest hesitation on our part in the duties and sacrifices she imposed upon us. “For our venerated Superiors she had a respect and obedience inspired by her great spirit of faith and she was prompt in executing not only their orders, but their least wish. Likewise, civil authorities, military officials, doctors and administrators placed an entire confidence in her. “In the beginning, she had numberless difficulties, finding herself at variance with many prejudices which she succeeded in overcoming, adjusting everything with much wisdom and firmness, for she knew how to convert the sentiments of those most opposed to her into admiration for her virtuous and saintly life. The strength necessary was the outcome of her solid piety, her unreserved confidence in God and her tender devotion to the Most Holy Virgin. But nothing would ever make one suspect that she had been the object of supernatural favors. “In 1867, Superiors sent her to Italy in the service of the Pontifical Army which, with so much heroism, was devoting itself in defense of a cause, alas! already despaired of. “After spending three days and three nights on the battlefield of Mentana, she went to Rome to equip and organize three ambulances; that of the Quirinal, that of Saint Agatha, and another whose name escapes my memory. “On this new field of action, where she displayed the same zeal as at Algiers, God had several consolations in store for her. Pope Pius IX, who soon appreciated her valor, often saw her and gave her more than one token of his fatherly kindness. He even sometimes allowed her to accompany him in his walks through his private gardens. Msgr. de Merode, who occupied a superior rank at the Pontifical Court, also held her in the highest esteem. In 1868, she left Rome to take the direction of the Hotel-Dieu of Carcassonne, where God granted her a great consolation. She received the visit of the Very Reverend Father Doumercq, Director of the Daughters of Charity in Algiers, who happening to pass through Carcassonne, came to see her. The Hotel-Dieu of Carcassonne was her last mission. She remained there thirty-five years (from 1868 to 1903), giving there, as she did in other places, the example of many virtues and accomplishing much good. June 16, 1868, Tuesday in the octave of Corpus Christi, she was installed Sister Servant of the Hotel-Dieu of Carcassonne by Sister Roche. Many adjustments were necessary in this establishment when she took charge of it. Yet without being discouraged by difficulties, she resolved to re-establish order, and courageously set her hand to the work which, with the help of God, she brought up to ex- cellent standards. “Sister Bisqueyburu, very intelligent, and of a quick and ardent disposition, took personal interest in all the details of the house; making her rounds through the duties in the twinkling of an eye, visiting the sick in their wards, having for each a cheering word and devoting herself untiringly to the service of God and the poor. “From the start, she undertook to put in good condition the old Hotel-Dieu of Carcassonne, which was very delapidated at her arrival. She had the floors of the corridors repaired, as they had suffered from the dampness that arose from the earth. The large stairway leading up to the second floor was built and iron beds were procured for the poor sick who had been very uncomfortable heretofore. Near each bed she had a red marble slab fixed for the convenience of the service, she even furnished the section reserved for the officers at her own expense, had gaslights put everywhere and had a clock set in top of the cupola. As previously it had been very poor, the usual fare of the patients and the Sisters was improved under Sister’s watchful direction. “The chapel, which had just been built, lacked the barest necessities. It was the pious Superior who supplied it with linen, sacred vessels, feast day vestments and all the objects required by the liturgy. She organized a choir and selected as an organist a young girl who had suffered from reverses of fortune and whose musical talent could be used to her benefit. “The administration of the Hotel-Dieu, whose extreme ideas were in opposition with hers, furnished her with the occasion of displaying a great patience, to which she united deference in their regard, but not to the exclusion of firmness when duty required it, and she at last triumphed over the great difficulties first encountered. In consequence, they esteemed her to such a degree that she possessed their respect and veneration. She was consulted by them in many matters and by degrees they entered into her views. Thus she had the consolation of seeing the Crucifix put back in its place of honor in the wards from whence it had been taken. At the same time public prayers which had been suppressed in the wards were resumed. “The doctors likewise appreciated her devotedness, her virtue and particularly, her exactness in carrying out their orders. “She loved the poor sick dearly with a maternal love. It was a happiness for her to visit them, to listen to their commplaints and to relieve them whenever she could. “Her vigilance was remarkable, and as she was quick on her feet one would have thought she was everywhere at once. “Doctors and administrators greatly appreciated her. Persons of the world had recourse to her as to an oracle, and always received from her light, consolation and strength. She did a great deal of good by opening both her heart and her purse to all sorts of woes and needs; but she was very clever in throwing a mantle over her good deeds. “Sister Bisqueyburu, Superior of the Hotel-Dieu of Carcassonne, concealed under an austere exterior and a quick manner a great depth of kindness and devotedness, exercised exemplary regularity and possessed a great spirit of faith. To this all her companions agree. “She had more than an ordinary devotion to the Blessed Virgin; a devotion which betrayed itself in her words and in the fervor with which she said the chaplet. When a patient refused the succors of religion, Sister Bisqueyburu did not wish that the Sister in charge should complain about it openly, but she herself went before the Blessed Virgin in the Oratory and recited a Memorare and rarely was her prayer fruitless. “Always up at four o’clock as long as her strength permitted it, always first at all community exercises, a strict observer of silence, Sister Bisqueburu held the Holy Rules in high esteem. But she was not like the Pharisees of the Gospel whom our Lord reproached for laying upon others burdens which they would not touch with their fingers, and if there be Sisters who found her too strict, they must confess that she was still more so to herself than to others. “I shall give you very simply what I have remarked in this worthy Sister. She was of a reticent disposition and if some persons have judged her less favorably, it was because they had neither sufficiently studied nor understood her. slightest resistance, which she reproved rather severely. But her severity soon changed into an unequalled sweetness as soon as she perceived that her admonitions were sincerely turned to profit. In consequence, she several times told me: ‘I have been severe toward my companions yet I never ceased to love them’. And more than one act of charity confirmed the truth of this statement. From the beginning of her vocation, this worthy Daughter of Saint Vincent had been the object of supernatural favors from the Most Holy Virgin, which we shall make known in the second part. Her humility managed to keep them completely secret for a long time; but in her last illness her companions succeeded in making her admit several revealing details. She regretted it as soon as she was aware of it; but without doubt God permitted this avowal so that we might have a full assurance of the authenticity of these favors. Something of this secret, however, had transpired, though it cannot be told how it happened; for one day when she still was at Algiers, some of her companions having gone to see good Father Girard, Superior of the Ecclesiastical Seminary, the conversation fell on the Miraculous Medal, the Scapular of the Passion and finally the Green Scapular which already had worked wonders in the conversion of poor sinners. “At any rate,” they said, “if for the Green Scapular there were visions, the secret has been well kept, for nobody knows who the happy seer is.”—–“But,” answered good Father Girard,”that privileged soul is your fervent Sister Servant . . .; oh! that does not mean you should go and publish it broadcast.” And they were faithful to the latter recommendation. On her part, Sister Bisqueyburu skillfully eluded the pointed questions which at times were addressed to her. “During the last years of her life,” said Sister Brun, another of her companions who had spent eighteen years with her, “we used often to speak to her about the happiness of souls favored with visions of the Blessed Virgin. We then more particularly dwelt on the Green Scapular which she recommended us to use with the patients in enmity with God, which, by the way, always proved successful. When we had a patient whose condition was critical, we recommended him to the prayers of our good Superior, made use of the Green Scapular and were always heard. But toward the end of her last illness, God permitted that she should be unaware of the purpose of certain questions addressed to her, thus betraying herself unconsciously. That illness lasted a long time affording her an opportunity for the practice of many virtues to the great edification of those surrounding her. To make sure of not missing any of the exercises of piety prescribed by the rules at the time appointed for them, she requested two of her companions to come and recite them aloud near her bed, and she joined with them the best she could. Moreover she kept in touch with all that was going on in the house and she still directed it by her orders and advices. “When her condition grew worse,” wrote Sister Naude, “we should have liked to speak of her about receiving the Last Sacraments, and yet, in spite of the saintly disposition we saw her in, the courage to do so failed us. We would have liked her to ask for them herself. But she very likely did not believe her state so alarming, and did not think of it. I therefore resorted to the following scheme: I slipped the Green Scapular under her pillow, saying to myself: ‘If she is the one to whom this scapular was revealed, the Blessed Virgin will not permit that her privileged daughter should leave this world without the succors of religion.’ At once, wonderful to say, she asked for a priest and received the Sacraments with the deepest piety. “This was two weeks before her death and during these last days, so painful for her, she edified us all by her patience, her gentleness, her kindness with regard to all. “Her weakness was as great as her emaciation and her life could be prolonged only by means of constant stimulation. “But her fears soon vanished and she henceforth spoke of nothing but Heaven and the Blessed Virgin. “I then ventured to ask her some questions of which she did not notice the purpose and which she answered without being aware that she was revealing a secret kept for more than sixty years. ‘What was the color of her dress?’ ‘White.’ ‘And her mantle?’ ‘Blue.’ ‘How did she wear her hair?’ ‘It was hanging loose about her.’ And she illustrated every statement with a gesture, whilst her eyes seemed to behold sweet visions of the past. 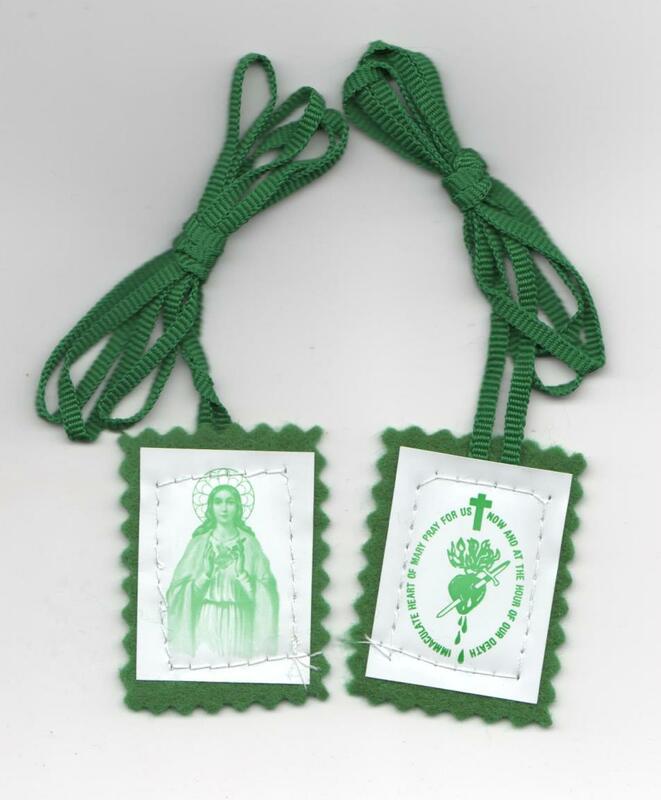 “I showed her the Green Scapular and she at once said: ‘Yes, that’s it exactly.’ And she piously kissed it. And shortly after, on September 23, 1903 (anniversary of St. Vincent’s ordination to the Priesthood, in 1660), she sweetly surrendered her soul to God in the sentiments of deepest piety, being in the eighty-second year of her age and the sixty-fifth of her vocation, leaving a perfume of sanctity behind her. There is no doubt that she now in Heaven beholds with happiness the august Virgin who so often deigned to appear to her in this place of exile! same sorrow . . .
“How I love to recall her humility, fervor, regularity! Ever in the path of duty, strong and noble in the hour of sacrifice, in sufferings, in all sorts of sorrows, she was for us the type of a true Daughter of Saint Vincent de Paul . . .
How much must her glory in Heaven be increased by that train of souls whose salvation was wrought through the Green Scapular revealed to her by the Immaculate Heart of Mary! In part one, we sketched in rather rapid strokes the life of Sister Justine Bisqueyburu; a life full of merits and good works, a life which is a tribute to the great Saint Vincent de Paul, whose worthy Daughter she was. From her life we may glean many lessons of virtue, which are for us a powerful incentive in the pursuit of virtue, of generosity in the performance of duty, of self-forgetfulness in the practice of Divine charity. But in the religious family of Saint Vincent such examples are so numerous, that it was not the mere purpose of relating them which induced us to publish these pages. God, by raising up this chosen soul in His Church and lavishing choice graces upon her, did not merely intend her to work out her own salvation, but had also destined her for a special mission in which the salvation of a multitude of souls was involved. Just as He had made use of a Daughter of Saint Francis de Sales, Saint Margaret Mary Alacoque, for the purpose of manifesting the Sacred Heart of His Divine Son to the world, He likewise willed to make use of a Daughter of Saint Vincent de Paul, Sister Bisqueyburu, in order to reveal the Immaculate Heart of Mary, to present it to the veneration of the faithful, and to make of its sacred representation an instrument for the salvation of infidels and poor sinners. True, a first manifestation of this most pure Heart had already taken place in the Chapel of the Mother House of the Daughters of Charity, on November 27, 1830. On the reverse of the Miraculous Medal, revealed to Saint Catherine Laboure, and since then known as the Miraculous Medal, the Heart of Mary appeared, pierced with a sword, opposite to the Sacred Heart of Jesus crowned with thorns and surmounted by a cross. Likewise, later on, July 29, 1846, another Daughter of Charity, Sister Appoline Andriveau, was favored by an apparition of our Lord, Who revealed to her a new scapular of a red color, on which, next to His Heart, was also that of His Mother, and which for this reason received the name of Scapular of the Sacred Hearts of Jesus and Mary. But in the apparition which Sister Bisqueyburu had, it is her Immaculate Heart alone which the Blessed Virgin wished to present to our veneration and our prayers, as we are about to see from the autograph notes of the seer, those of her Director, Father Aladel, and of her Directress, Sister Buchepot. We have already seen that after the expiration of her postulatum at Pau, Justine Bisqueyburu undertook the journey to Paris, accompanied by Father Aladel, and that she entered the Seminary of the Daughters of Charity (140 rue de Bac), November 27, 1839. As she did not arrive there in time to take part in the great retreat which had closed just a few days previous she had to wait until the following January before being able to make her little entrance retreat. In those days, the retreat exercises were held in a hall situated above the chapel, in which there was an altar bearing a statue of the Most Holy Virgin. This statue, reputed miraculous, is of very ancient origin. Now, it was in this hall and before this statue that the new little Seminary Sister made her entrance retreat; and it was during that retreat that the Blessed Virgin appeared to her for the first time on January 28, 1840. The Sister was at prayer when suddenly the Blessed Virgin made herself visible to her eyes. She was dressed in a long white gown which reached to her bare feet, over which was a mantle of very light blue, but she wore no veil. Her hair hung loose about her; in her hands she held her heart, from the top of which abundant flames gushed out. The majesty of her bearing was enhanced by a beauty all heavenly. At this sight, the young Sister, struck with admiration and awe, almost let a cry escape her lips. Again at the close of the retreat she was favored with the same vision, and also four or five times in the course of her Seminary on the principal feasts of the Blessed Virgin. Up to that time this favor seemed to have been quite personal and to have had no other purpose than to increase her tender devotion to Mary and her Immaculate Heart. But the course of events showed that God had other designs which were soon to be revealed. After receiving the Holy Habit, Sister Bisqueyburu as already said, was sent to Blangy (Seine-Inférieure) to teach school. Shortly after her arrival, September 8, 1840, feast of the Nativity of the Blessed Virgin, she had another vision. The Mother of God appeared to her during meditation, holding in her right hand her heart surmounted by flames, and in the other hand a kind of scapular, or rather one-half of a scapular. It was a single piece of green goods, rectangular in shape and of middle size hanging by a string which was green also and closed as if destined to go around the neck. The whole thing looked more like a medallion of cloth, than a scapular properly so called. On one side was a picture of the Blessed Virgin such as she had shown herself in her preceding apparitions; and on the other side was a heart all ablaze with rays more dazzling than the sun, and as transparent as crystal. Those are the very expressions made use of by the Sister to describe the vision. That heart, pierced with a sword, was encircled by an inscription of oval shape surmounted by a gold cross, and thus worded: Immaculate Heart of Mary, pray for us, now and at the hour of our death. “At the same time an interior voice was heard by the Sister revealing to her the meaning of the vision. She understood that this holy picture was by the medium of the Daughters of Charity, to contribute to the conversion of souls, particularly infidels, and to procure for them a good death; that copies should be made as soon as possible and distributed with confidence. On Thursday following, September 16, Father Aladel received in fact this new communication. But whether he did not attach enough importance to it, whether prudence inspired him not to rush matters, in order to test whether these supernatural manifestations came from God, according to the Apostle (1 Joann., iv 1), he did not seem as yet to take active measures for the making and distribution of the scapular. We can see hereby that the wishes of the Blessed Virgin had received attention as far as the preliminary steps were concerned, since Mr. Letaille had been entrusted with the engraving of the plate destined to produce prints of the image of the scapular and that partly he was accountable for the delay. At last the scapular could be made, although only in small quantities, but it was not given with sufficient confidence and more by way of experiment. Hence, the results were not very satisfactory. And in another letter, bearing the date of the following month of the same year, 1846, and also addressed to Sister Buchepot, she told her: “For a long time I have had a desire to write to you; but I did not dare to do so, because I am always afraid to be in a state of illusion. Today I want to overcome this ill-founded fear, and wish to be toward you like a little child who speaks to her mother with complete openness of heart. “Has Father Aladel arrived? I forgot to tell you that he asked me whether the scapular (such as it had been made with the plates of Mr. Letaille) was really exact. I answered in the affirmative, that I did believe it was; but perhaps I answered too hastily, for now, as far as I can remember, it seems to me that it had no rays proceeding from the hands of the Blessed Virgin and reaching to the hem of her garment. And however, it seems to me that is the way she appeared the last time. It seems to me, understand well, for I am always tempted to consider all this an illusion of the devil, who perhaps makes use of this means for my destruction, making me believe things that are not. And she asked that they should send her the picture of the scapular that she might add to it with lead pencil the rays as she saw them at the last apparition. They did not believe it was necessary, however, to have the engraving made over, and it remained and still is without rays. It was thought that this omission of detail would not prevent the scapular from corresponding substantially to the desires of the Blessed Virgin. They did better; they went more actively about the printing and making of the scapular, and distributed it with more confidence. But one difficulty arose whose solution could not be found in the preceding revelations. What were the conditions required to render this scapular effective? Must it be submitted to a special blessing, be imposed with certain ceremonies, oblige those who wear it to certain prayers or practices, should it be used only in behalf of infidels and in foreign missions only? That the scapular, not being like other scapulars, the habit of a confraternity, but i merely two holy pictures put on a single piece of goods and hanging by a string as would be a medal, no special formula is requisite to bless it and there can be no question of imposing it. It suffices that it be blessed by a priest and worn by the infidel or sinner whom we wish to benefit by its happy influence. It may even be slipped unknown to him in his clothes, or his bed or room. As to the prayers to be recited, there is but one that should be said every day, the one that forms the oval inscription with which the Holy Heart is surrounded on the Scapular. Immaculate Heart of Mary, pray for us now and at the hour of our death. If the person in whose behalf this scapular is applied should not say it, then the one who makes use of or gives the scapular must say it in her place. This scapular may be used in France, as well as in foreign lands. The greatest graces are attached to its use; but these graces are more or less great in proportion to the degree of confidence which accompanies it. This was the meaning of the different kinds of rays which fell from the hands of the Blessed Virgin at the last apparition. These indications were exactly complied with, and the scapular being applied under these conditions, produced henceforth, and is ever producing an incalculable number of marvelous conversions and sometimes cures. In the third part the relation of some of these marvels will appear. Are not these wonders like an authentic proof of the supernatural origin of this devotion, and of the sanction which God Himself seems thus to give it? But it may be wondered whether or not it has been submitted to the decision of the Church; whether it has some ecclesiastical approbation to recommend it. In the first place, everything leads to presume, though we have no written token of it, that our Father Aladel, so wise, so prudent and so cautious, did not authorize the making and distributing of the Green Scapular without making sure, beforehand, of the approbation of the Archbishop of Paris, Msgr. Afire. Thus we saw him in 1832 humbly asking of the predecessor of Msgr. Affre, Msgr. de Quelan, the authorization for the striking of the Medal revealed in 1830, known since then under the name of Miraculous Medal. How can it be thought that for the Green Scapular, which is a kind of medallion of cloth, he should have believed himself dispensed from a similar measure? How can it be thought that Mr. Letaille, so Christian a publisher as he was, would have been willing to take a share in the diffusion of a devotion which would not have been sanctioned by the first pastor of the diocese? However for this devotion, spreading little by little not only throughout France but even abroad, an approbation merely diocesan might have appeared insufficient to certain doubtful minds. Hence it was resolved to solicit from Pope Pius IX an ampler approbation which would silence any scruples. “Having spoken about the Green Scapular to the Holy Father, I related to him the details of its origin adding that particular graces of conversions among hardened sinners had been obtained by means of it. When asked me whether I had any with me, I answered in the affirmative and showed him one. The Holy Father took it, examined it attentively and said to me: ‘This is a beautiful and pious picture.’ Then he added, ‘Well, what do you wish in this matter?’ I answered, ‘Nothing else than the permission for our Sisters (the Daughters of Charity) to make and distribute scapulars similar to this one, with the faculty of distributing them.’ Then he said: ‘I give full permission for that. Write to these good Sisters that I authorize them to make and distribute them. ‘ ” Hence it is plain that it was with a full knowledge of the matter, after attentively considering this image, that the Pope, while praising its beauty and piety, gave his sanction thereto. What more could be desired? In fact it is here a question of nothing but a pious image and not of the badge of a confraternity. And the new Canon Law (Can. 1385, 1,3:2) which forbids the printing of any pious picture without an ecclesiastical authorization, says that this authorization must be given by the Ordinary of the place inhabited by the author, or that where the picture is to be printed, adding that for religious a permission from a Major Superior is moreover required (ib., 3). Now, in 1911 there appeared at Lille a pamphlet of eight pages on the Green Scapular with a reproduction of its two pictures; and this pamphlet bore the approbation of Most Honored Father Fiat, Superior General of the Mission and the Daughters of Charity (July’ 8, 1911), and also an authorization of Msgr. Delamaire, Coadjutor and soon afterwards Archbishop of Cambrai (July 13, 1911). Hence there need be no anxiety about the legitimacy of this devotion. Not only does it fall under no censure, but it moreover presents itself to the piety of the faithful with all the warrants required by the Church. Also after living for a long time in obscurity (too long, perhaps), it does not fear now to appear in broad daylight. And the Community of the Daughters of Charity, while keeping the monopoly of the Green Scapular, has decided to put it on the market. Therefore those persons who wish to procure that precious pledge of salvation must have it blessed by a priest (any priest has this power), and they must observe the conditions previously pointed out. 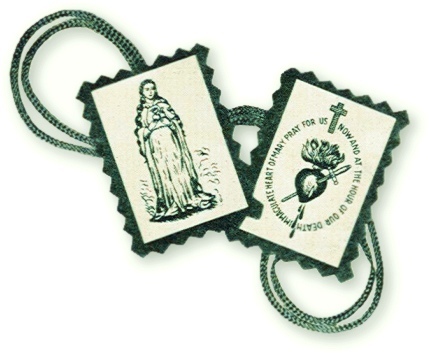 As to the graces of conversion or others which shall have been obtained by means of the Green Scapular, those who know of them are requested to send an account of the facts, exact and authentic as possible, to Saint Joseph’s, Emmitsburg, Maryland; being careful to mention precisely the circumstances of time, place and persons; not fearing under pretense of humility to give the names. It is a question of glorifying God and His Most Holy Mother. “Yes, if it be given with confidence, there will be a great number of conversions.” Cures obtained by the same means are not so numerous, though there have been some. It is absolutely impossible here to mention all these favors. We shall confine ourselves to relating just a few. They will suffice to justify the promises of the Blessed Virgin, and to inspire confidence in the use of this new pledge of salvation which we owe to her maternal kindness. This is very likely the first or one of the first attributed to the Green Scapular, for it took place September 30, 1842, and the first Scapulars were made in 1841. This wonderful conversion may be considered as a reward not only for the zeal which Mr. Letaille displayed in bringing about the conversion of his bookkeeper to the practice of religion, but also for the religious eagerness he showed in attending to the engraving of the plate used in printing the Scapular. The relation that follows is most authentic, based on the testimony written by persons who were in closest touch with the event: the convert himself, Mr. Copin, then Mr. Letaille, Father Aladel, and Sister Grand. It is from these testimonies, carefully preserved in the Archives of the Congregation of the Mission, that the following details are drawn. Mr. Copin, who was born about the year 1792 amid the disturbances of the Great Revolution, had not received a Christian education. Having had no religious instruction, he knew the Church, her doctrine, her ceremonies and her ministers only through her detractors. He had at first entered upon a military career and served in the army of Napoleon I, taking part in several campaigns. He had reached the rank of under officer when, in a battle against the English, he was wounded and taken prisoner. He married one of the employees of the house—–much younger than himself—–and was very good to her and practiced in his home all domestic virtues. Nothing was wanting to make of him a perfect man but to add to these natural virtues faith and the practice of religion. At that time (1840) Mr. Charles Letaille, who had himself returned to God after two years of hesitation and prayer, felt in the fervor of a neophyte the need of imparting to others the faith he had regained and which he had attributed to Our Lady of Victory. “When we became acquainted, we both were skeptical philosophers, discussing everything, doubting everything, but more through ignorance and presumption than prejudice. “As soon as I had embraced the practice of religious duties, I felt the need of special studies in order to explain my conduct and to be able to answer as a Christian to the attacks directed against me on all sides. To this effect I implored the help of the Most Holy Virgin. “I consecrated myself to her promising her that if she would guide me in all things, I would no longer concern myself about anything but to serve her Divine Son under her banner. “Mr. Copin became the companion of my religious studies and for two years (1840-1842) we interrupted our monotonous secretarial work only to discuss points of dogma or ethics. “With God’s help, I soon became better example, it took me a considerable time to convince him on a point which seemed to me at first insurmountable; he could not see how all the animals could have fitted in Noah’s ark . . . ! Among those persons were Father Desgenettes, the saintly pastor of Our Lady of Victory and founder of the famous Archconfraternity which bears that name; a Jesuit Father who is not named; two Daughters of Charity of the Mother House, Sister Henriette and Sister Grand, on duty in the secretariate, lastly Father Aladel, Director of the Community of the Daughters of Charity, and confidant of the revelations of the Blessed Virgin to Sister Bisqueyburu concerning the Green Scapular. It was thus God was pleased to surround this predestined soul, who was soon to appear before His tribunal, with all that could help him to secure a favorable judgment. That moment, in fact, was not far removed. “Meanwhile,” related Mr. Letaille, “the worthy Mr. Copin fell sick. At first it was only a sore throat, a hacking cough which seemed not very alarming. However, the case was most serious. Mr. Copin, whose body was worn out by the privations and fatigues of his military campaigns, was by these facts predisposed to disease. His lungs became ulcerated and his condition grew critical. Yet his state of soul inspired him with no anxiety regarding eternity. Fortunately, others thought of it in his place, and Mr. Letaille’s zeal for his friend increased in proportion to the imminent danger. “In this extremity,” he said, “I had recourse to some means which I deemed to be decisive. I obtained the consent of the venerable Father Desgenettes, my Director, to pay my patient a visit. He came to see him several times, and each time had a long talk with him, but alas! without any success. The poor sick man said that he would be very glad to know the truth, but that he felt himself surrounded by darkness which prevented him from seeing the truth. As he was gifted with an upright and sincere soul, he did not wish to perform an action contrary to his convictions. There were in particular two Sisters of the Mother House, Sister Henrietta and Sister Grand, who very efficaciously helped Mr. Letaille in his zealous efforts to bring about the conversion of the dear patient. Sister Grand took charge of pleading his cause with the Very Reverend Father Aladel, whom she induced to visit the patient. “I saw Father Aladel this morning,” she wrote to Mr. Letaille, on Saturday, September 17, “and he consents to see the patient, not thinking, however that he will be able to hear his Confession. Nevertheless, I look upon this visit as a great blessing; I induced him to pay it tomorrow, Sunday, after Vespers, that is about four or five o’clock.
. . . etc. . . .
“Consider whether it is better for Father Aladel to meet at your house or at his and then come and tell me tomorrow, Sunday, before our High Mass, which is at eight o’clock. “I dare hope that the Blessed Virgin will bless this visit. Please offer tomorrow’s Communion for that intention. This soul must, must be saved, our Lord wishes it—–the Blessed Virgin wishes it.” It can be seen what a heart of an Apostle this good Daughter of Charity possessed! Mr. Copin accepted the scapular to please his friend, and even wore it on his person, but without attaching much importance to it. However, the disease made rapid strides and Father Desgenettes advised Mr. Letaille to enlighten the patient upon the seriousness of his state and to tell him that his end was near. “I was the only Christian friend,” said Mr. Letaille, “who could venture for his salvation such an announcement and it cost me beyond words. I appealed to the Blessed Virgin for light and grace. I prayed myself weary and then went out to my patient. “The conversation soon fell upon Heaven. It was our usual subject. And I told him gently, without effort, that the time had come for him to think of it . . ., that the end of his mortal career was near at hand . . .
“The moment however was not far distant when this distress was to be changed into great joy; the Immaculate Heart of Mary was soon to work a great favor. The patient spent the greater part of his time in bed; but he rose each day, worked at his bookkeeping and even ate at the table with his family. On Friday morning, September 30, Mr. Letaille called to see him, but the conversation was very superficial and religion was not even mentioned. The little success of the preceding day lent no encouragement to a fresh attempt. Now, in the evening of that very Friday, about seven o’clock, Mr. Copin was at table with his family, when all of a sudden, he rose abruptly, left the table and retired in his bedroom. There he fell on his knees before an image of the Blessed Virgin and took his Green Scapular in his hands as a “medium” as he expressed himself; he kissed it respectfully, and shed abundant tears. Then he felt impelled to promise the Blessed Virgin that within the week he would seriously settle the affair of his conscience. Rising, he went back to his family, but soon he retired again, went on his knees in a recess near his bed, weeping and praying, and finished by promising our Blessed Mother not to wait a week but to attend to it the very next day. Immediately he wrote the following note to Mr. Letaille: “Most dear friend: I have to speak to you about many things; and if you could give me a few hours tomorrow afternoon, I would consider it a great favor. I made a promise to our good Mother, I prayed hard to her yesterday and am most anxious to see you about it. Good-bye, pray for me, I need it so much! It is in your house I should like to see you; here my emotion would be too great. What a sudden and truly miraculous change! That man, usually so cold, so matter of fact, so far from any religious practice, now weeps, prays, promises Mary not to puff his reconciliation, with God, and writes to his friend to declare himself vanquished! “On the Tuesday following, October 4, the patient received the visit of Sister Grand and the day after, on Wednesday the 5th, that of Father Aladel, who joyfully convinced himself of the reality of this surprising and sudden conversion. “My dear Sister, I am sending you this note to ask you to help us to thank our Immaculate Mother, for the protection she never ceases to show us. “Everything went well. Our dear patient has been somewhat tried but I do hope that with the help of God this will make him much the stronger. “Yesterday, Monday, Father Hanicle (the Pastor of Saint-Severin’s) as he intended to come to hear his Confession, had to go to the ministry and returned only at nine p.m. Our poor sick man waited for him patiently, went to Confession at nine o’clock and then returned home. “The next day, that is to say, this morning, he had to undergo a fast that was extremely difficult for him, considering his condition. He had to abstain from every drink, lozenge, etc., from midnight until after eight o’clock. “This morning, exactly at eight o’clock, he came with his wife to Saint-Severin’s and I arrived with my mother. He was very weak; but you know how brave he is. As it was somewhat cold we took him to the sacristy to warm himself, while waiting for the priest, who was not long coming. He had a few scruples of conscience which he wanted to submit to Father but they could not have been much for it did not look as if Father gave him absolution. “After that we went to the altar of Our Lady of Holy Hope. We followed him, the four of us—–he, his wife, my mother and I—–united in one same thought, in one same sentiment. “To spare him every subject of confusion, I told him to do everything he would see me do, and you may believe I kept him sitting as much as possible. “At last the moment of Communion arrived, and under the protection of our good Immaculate Mother he received our dear Master! Praised and adored be at all times the Most Holy Sacrament of love, and blessed be forever the purity and Immaculate Conception of our good Mother! Amen! Oh! my dear Sister, how good God is . . . ! And our Blessed Mother, too! “After the last Gospel, I sat with him to help him make his thanksgiving; when our dear Lord Who just now had reassumed His rights over our poor hearts, willed by a magnanimous gesture to take us all together to Himself. How welcome to me was the thought with which he then inspired Father; for as I am thinking it over, it seems to me as if our Lord wished thus to bind us to Him before everybody. This is how it happened. “Last Thursday I went to see that poor patient, to congratulate him for the great grace of his First Communion. What a sweet impression I carried away from this visit! If it were possible that I could doubt the infinite goodness of God, I confess that I would there have found incontestable proofs of it . . .
“Sister Pineau was with me. We found Mr. Copin in bed, very weak, but calm and perfectly resigned. “As I expressed the anxiety which I had felt on the day of his Communion at the thought that it would be very hard for him to stand the fatigue of waiting until morning, followed by the long stay in the Church, he answered: ‘No, Sister, I was not tired that day. On the contrary, I went to bed at eight o’clock in the evening and the whole day was spent in the sensation of my happiness. In the morning I had something that worried me, and, as I wished to prepare calmly for this action, I wanted to see Father Hanicle once more to settle it. He soothed me by saying that I had already confessed it. “I feared lest I should be very cold and yet I could prepare myself better than I had dared to expect. And afterwards, all the remainder of the day I felt too happy. You see it was something so overpowering that it was a case of telling our dear Lord it is enough. I could not bear so much, I thought I was gone; nevertheless I was calm and peaceful, saying to myself that I ought to accept that consolation, not for its own sake, but for the precious memory of it that would remain with me. I was so full of my happiness that it seems to me I could not have spoken of anything else . . . I was wishing that everybody would love God, that everybody would come to seek Him here in Holy Communion, and I so much regretted not having loved Him sooner! “In presence of such sentiments, and contrasting them with those that animated Mr. Copin a few days ago, one cannot help considering such a change as humanly inexplicable, as a real miracle of grace. “That Communion, as well made, imparted to him a strength and courage that never left him during the few days he had still to spend on earth. “I remember,” related Mr. Letaille, “that when he finished his thanksgiving, he reached me his hand saying: ‘Now I have received enough to last to the end; I ask for nothing more.’ He felt that henceforth it would be his turn to give. and friends calmly and there was in his greeting something more cordial and affectionate than before his conversion; he let them see without affectation that he was using the rosary which never left him, as well as the Green Scapular that hung on his breast. He spoke to them with humility, but also with firmness, of his conversion, which he considered the greatest good fortune of his life. “At last the end of his suffering came, for he did suffer greatly, but he knew how to conceal his pain with great fortitude. He liked especially to reassure his wife by assuming a cheerful countenance. As he judged her too weak to assist at his death, he begged me to keep her at a distance, and he bade her farewell in a note which he placed under the marble slab of his writing desk. “His agony was incredibly sweet. Even then, when he could no longer hear what I said to him, with eyes riveted and face aglow, he repeated three or four times very distinctly: ‘Ah! how glad I am! Ah! how glad I am!” Then he passed away gently. It was time for classes to begin in a large High School, and all the pupils were ready and interested in the subject, except one, and where was she, she who was always on time and fully alive to the day’s work? Alas poor N. had a heavy little heart that morning and she was waiting to see the Sister Superior, to unburden her sorrow to the kind Sister whom she felt would help if anyone could. “Good morning, N., what can I do for you?” asked Sister. “Poor N. started on the way home and did as she was told. The sorrow stricken mother received Sister’s message and with a heavy heart, but as one clutching at a last straw, she began the hours of prayer for her poor deluded child. Surely Mary would help in this hour of anguish! The morning dragged on, the mother prayed, and Sister Superior too, and her students implored Blessed Mother for ‘something very urgent that morning’; and all waited almost breathlessly for the outcome. Early the next morning N. arrived in school, but oh, with what a different feeling. No, her sister did not marry that man as planned on the previous day, and this she hastened to impart to Sister Superior. With animation she came to tell Sister that the man who was in the army and who was permitted to have the day off for the marriage, when he came and saw how heartbroken the girl’s mother was, said to his intended bride, “We had better wait, I could not go through this with your mother feeling as she does, let us wait a short while and see if she will not get over this and give her consent.” What a surprise; what a moment of intense relief! Yes, Blessed Mother was doing her work and would continue to shield her child who had been so faithful to her in days gone by. So the marriage was put off indefinitely. However, it was decided between the couple that if the groom-to-be could get a furlough, they would be married, hoping by this time the mother would be reconciled. Sister urged the girl to tell her mother to continue the prayer and she knew Our Blessed Lady would not let that marriage take place. The prayer was answered. Just a few days before the furlough, all leaves of absence were withdrawn, that division of men ordered to start for parts unknown and all communications between the man and the girl were broken off. Thus did Mary show her power and reward the confidence of her humble servants who confided in her. A patient was entered in the hospital as a Protestant and was operated on. A short time before she was to be discharged, the patients in the room with her received the Sacraments of Penance and Holy Communion. One day she remarked that she was a Catholic and had been brought up in a Catholic orphanage till she was almost twelve years of age. Then she had gone out to work in a good family. Later, she was married out of the Church and had brought up her children as Protestants which Church she herself had joined, about thirty-two years before. She very much resented being asked if she would not like to return to her own Faith, notwithstanding which she willingly accepted a Green Scapular. The next morning, the Sister, who had given her the scapular, came into the room and she noticed a worried look in the eyes of her patient. On inquiring if she could assist her the woman said she would like to see a priest. Throughout the long years she had been most unhappy for having left her childhood’s faith but the friends she consulted had told her she never could return. She received the Sacraments and sent for her husband and told him she was determined henceforth to live up to the Catholic Church. Thanks to the Green Scapular she continues faithful to her good resolutions now she is again at her own home. A young couple who were very wealthy suffered by losing all they had and were reduced to a state of great poverty. The wife was a Catholic but the husband a Protestant; their three little boys were being brought up Catholics. After they met with reverses, the mother became careless about her religion and neglected sending the children to church or catechism because she had no fit clothing for them, and in time all religion became a thing of the past in the family. Again, the wheels of fortune turned and they not only retrieved what they had lost but became millionaires. The mother gradually returned to the practice of her religion as did also two of the boys, but the oldest one did not. This was a source of continual worry to the mother who realized she was responsible before God, for, the son, now 55. He ignored all efforts to win him back. A neighbor, learning the facts, gave the mother two Green Scapulars and told her to have him wear one. He laughed and refused to do so. She then placed one on his bed and sewed the other in his suit. A few weeks later he said to his mother: “Guess where I have been. I have been to the Jesuits to have them instruct me in my Faith and prepare me to approach the Sacraments.” Shortly after he made his First Confession and received his First Holy Communion. The family are extremely grateful to Our Lady of the Green Scapular. The following incident occurred in a hospital conducted by the Sisters of Charity. A woman in one of the wards inquired for a Sister whom she had known some years before. The Sister went to see her immediately and found her suffering with a gangrenous leg and the Sister in charge of the ward gave the visitor very little hope of recovery, saying that it was well-nigh impossible to save the leg and she feared it would have to be amputated. This was sad, for the poor woman had no idea her condition was so serious. She was also a victim of diabetes. The leg was so swollen it looked more like a piece of stone than a human leg. Some days passed and as the leg was treated every day without showing any improvement, the poor patient began to be despondent about her cure. Pitying her condition, a Sister gave her a Green Scapular, telling her to put all her confidence in our Blessed Mother. Lovingly and with kisses, she put it around her neck. The Sister also gave her a prayer leaflet of St. Joseph, and since it was the month of March she began a novena to St. Joseph. On the nineteenth, Feast of St. Joseph, she was much improved, for the greater part of the pain had ceased and the doctors now looked for her recovery. At the end of two weeks she was permitted to return home, where later on two of the Sisters called to see how she was progressing. She told them her leg was getting on fine and that the attending doctor thought that he would only need to make two more visits before he discharged her. She was still wearing the Green Scapular and she said she felt sure her recovery was due to Our Lady of the Scapular. Again and again, her children, who are quite grown, expressed their appreciation of their mother’s cure and their gratitude to the Queen of Heaven. My father, a convert for about eighteen years, left the Church over fifteen years ago because he said he could not believe in the Immaculate Conception and in the Infallibility of the Pope. During these intervening years he has often expressed the desire for the grace of Faith, but it was not until this year that it came. Since last May, he has been wearing the Green Scapular and has said the prayer on it, asking others to pray for him also. Several days before he went to Confession, a Sister spoke to him about Our Lady and it seen that this time our Lord opened his eyes to the possibility of this mystery. On the afternoon of the Feast [the date not provided in the account] of the Green Scapular, my father went to Confession and every day since then he has received Holy Communion. He has told me since that he will always wear the scapular and each month he has Mass offered in thanksgiving to Blessed Mother for his return to the Faith. “Please, Sister.” With that she put one over my head. A feeling of tremendous confidence poured into me and the bleeding stopped. Two days later, in the X-ray room, they asked me when the hemorrhage had ceased. When I replied that it was a matter of a couple of days, they expressed great surprise. “You have a wound that is six months healed and there is no other mark.” Today even the scars are gone. No wonder I speak of an unpayable debt to her Immaculate Heart. Since then I have done everything possible to foster this devotion. To my great joy and amazement, those to whom I have spoken of the Green Scapular have become more zealous than I. Never have I seen the equal of the faith and confidence of these new apostles of Mary. During May I asked the rector of St. Patrick’s, Toronto, for permission to speak of it at the Wednesday devotions. I had a thousand Green Scapulars on hand, but no one thought that more than thirty would be asked for. The thousand were gone the first morning. The room where we distributed them was so jammed that I feared someone would be injured. The rest of the day I was besieged on all sides for more. Foolishly, I showed the one I had for myself and it was quickly snatched from my hand. They will repeat the description of the Mother of God, standing in all her beauty before the young novice, and returning again and again until the Scapular was made and distributed. Telling the young Sister that the Scapular could be blessed by any priest, carried or worn on the person, even left in one’s room. Ten years after the manifestation of the Miraculous Medal to Sister Catherine Laboure in 1830, the Blessed Mother entrusted the Green Scapular of the Immaculate Heart to Sister Justine Bisqueyburu, likewise a Daughter of Charity of St. Vincent de Paul. The manner of using the Scapular was indicated by the Blessed Virgin. Since it is not the badge of a confraternity but simply a double image attached to a single piece of cloth and suspended from a cord, investiture is not required. It suffices that it be blessed by a priest and worn by the one for whom it is intended. It may be placed in the clothing, on the bed, or simply in the room. The only prayer is the inscription surrounding the heart on the reverse of the Scapular: “Immaculate Heart of Mary, pray for us now and at the hour of our death.” Although wonderful graces are obtained, they are proportionate to the confidence with which it is given. Reports of conversions and cures attributed to the Green Scapular should be sent with details of time, place and persons to the Daughters of Charity, Marian Center, address below. Nihil Obstat: E. A. Cerny, S.S., S.T.D. Oh most Merciful Father, today I beg Thee to accept my sincere act of love in consecrating my entire life to Thy Son’s most Sacred Heart. I do this not alone my dearest Father, but through the Immaculate Heart of Mary, Queen of the Green Scapular. With her heart so pierced with the seven sorrows, at the beginning of Thy Son’s life until His tortuous death, she cries daily for those who choose not to love Thy Divine Son, Jesus. Even today with so many souls choosing to spend their eternity in Hell, she longs for our intercession to bring others to know and love our God: the Father, Son and Holy Spirit. We ask then Almighty Father that Thou wouldst permit us to place all these souls in Mother’s hands, those whom have touched our life in some way. We wish to consecrate today our family members, friends, yes even our enemies; to the Sacred Heart of Jesus. We know that Thou, our Divine Majesty, wilt refuse Thy Son nothing, and that Thy beloved Son can refuse His Mother nothing when it comes to the salvation of souls. I make this act of Eternal Consecration only once, my Merciful Father, and beg Thee to apply its merits to those whom have their names placed on a Green Scapular. We offer for those souls Thy Son’s most beloved Body and Blood in the Holy Eucharist, along with the Rosaries, prayers, joys, sacrifices and sufferings of each day, past and present until the end of our lives. We know with great confidence that the Queen of the Green Scapular will not rest until she secures the gift of Final Perseverance for all those living souls clothed in her Green Scapular. She will beckon her Divine Son for, not only the spiritual conversion back to Thee, Eternal Father, but also physical cures of those whose mission on this earth requires Thy Son’s gift of a physical healing. Most holy Lord, Father Almighty, if it be Thy Divine Will, allow me to serve Thy Son and His Mother daily in this struggle against the infernal enemy, where together in Communion of Thy Son’s Divine Mercy, we may bring forth the reign of the Immaculate Heart by placing the entire world on Her Green Scapular. Amen. Thank you for this website Lord God Father to inspire us to be like our Lord Jesus with the help of your Daughter Mary the greatest intercessor of all your beloved creations. Thank you for this Hope. Thank for for Sister Bisqueyburu, and The Daughters of Charity of our beloved St Vincent de Paul. Oh how fortunate we are through you who have never forgotten us. Love you and serve you my God. Good is not good if one does not suffer in doing it.